The wetlands of Grand Turk unfortunately don’t compare to those that can be found in the Caicos Islands. Kayak tours typically take place in the interior and sheltered South Creek, which really doesn't have large amounts of wildlife. 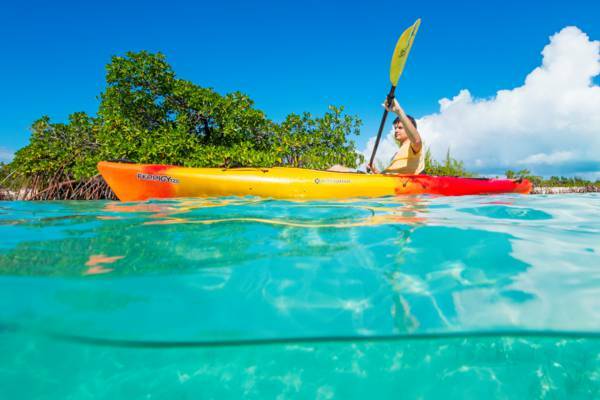 Kayaking is a great way to explore the mangrove wetlands of the Turks and Caicos. Of the main islands in the Turks and Caicos, Grand Turk offers the poorest kayaking. Only two general areas are feasible: off the west coast beaches and the sheltered North Creek. For visitors to Grand Turk, kayaking can be done as a guided cruise ship excursion tour, or as simple rental. On Grand Turk, plastic sit-on-top ocean kayak are the common vessel choice due to their ease of use. It doesn’t take much practice to learn basic paddling skills, and most will cruising within a few minutes. The best wetlands and wildlife sightings are found in the beautiful, remote, and difficult-to-access 83 acre (74 hectare) South Creek National Park, found between Matersons Point and Hawkes Nest. Unfortunately, currently no businesses offer tours at this site. A two or three hour kayaking tour is offered as a shore excursion to cruise ship guests through the cruise lines. 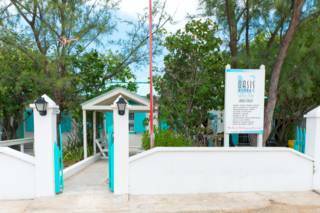 This package leaves from the Grand Turk Cruise Center, with transfer by small shuttle bus to North Creek, where there's a short walk on a wetlands trail and the kayak launch area. As part of a guided eco-tour, there’s very little to for you to worry about. Transport, equipment fitting, and basic instruction is included, so simply enjoy the experience. Guides are also able to help identify wildlife. Along with fish, it’s common to spot barracudas and stingrays in the water. Bird watching is also decent, with ospreys, brown pelicans, sanderlings, stilts, green herons and cattle egrets being regular sights. Designed to accommodate everyone, this excursion is neither strenuous nor long distance. Due to the island of Grand Turk's very small size, it's impossible to get a sense of immersion when paddling through the wetlands due to the surrounding buildings, boats and the occasional piece of junk machinery. However, there are some nice views on this trip and it's possible to see some wildlife. For guests staying overnight on Grand Turk, complimentary kayak use from your accommodation or rental from one of the Cockburn Town dive shops is another option. When there's no ocean swell, kayaking off Cockburn Town Beach, Governor's Beach and Pillory Beach is an excellent way to see the town from the water. The ocean off the west coast of Grand Turk often offers excellent visibility, and you’ll see reefs and coral on the bottom below, many of which make for great snorkelling sites (and excellent diving further out on the wall). When kayaking on your own, be aware of currents and wind. If possible, begin your journey upwind so your return trip is easy. We recommend paddling along the shore, as it’s typically sheltered by the buildings and land. Wind conditions are usually a bit stronger further out off the coast.